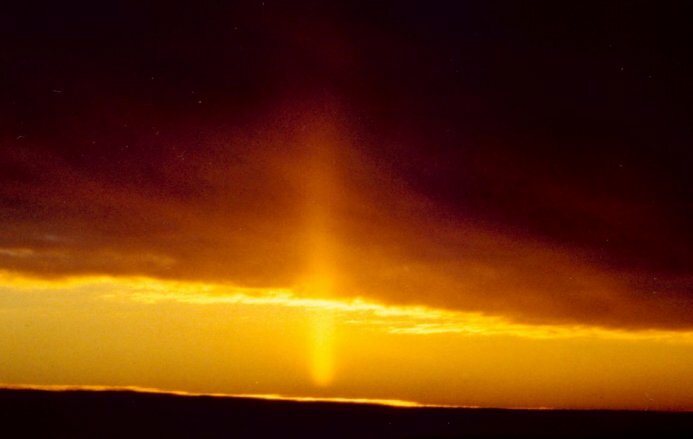 Photo of the Week.. A spectacular sunpillar, caused by reflection of sunlight from floating ice crystals, spears upward from a bank of clouds that lies above the eastern horizon. The Sun is entirely hidden below the cloud edge. The pillar starts brilliantly in seemingly clear air. Moments later the Sun appeared brilliantly above the cloud bank. Seen November 27, 2002. Such "clear air" sunpillars are rare. Astronomy news for the week starting Friday, November 29, 2002. The Moon moves through its waning crescent phase the early part of the week, and disappears at new Moon the morning of Wednesday, December 4th. Consistent with our having had an eclipse of the Moon last full Moon (even if penumbral), the new Moon will pass over the disk of the Sun, producing a total solar eclipse that stretches from South Africa through the south Pacific to Australia. Nothing, unfortunately, will be seen in the Americas. We will still get quite the show, however, as the thinning crescent will make a beautiful configuration with reddish Mars and brilliant Venus the morning of Sunday, December 1, the three bodies making a fine triangle with the Moon to the upper left, Mars to the right, and Venus below. The separation between the Moon and Venus will be particularly tight, yielding a spectacular sight. Moreover, Venus will be near her best, as she reaches her greatest brilliance the evening of Friday, December 6, so on the mornings of the 6th and 7th the planet will be at the brightest we can see it. Mars, on the other hand, is the least of the trio, so far away from us now that it is still only second magnitude and vastly outstripped by Venus. The same day as the new Moon, Wednesday, the 4th, Jupiter (rising around 9:30 PM) finally becomes stationary against the background stars, and begins its retrograde movement about midway between the bright stars of Leo and the dim ones of Cancer. Saturn, well to the west of Jupiter, is now up by the time evening twilight ends. Moving slightly westerly each day, Saturn has now moved out of the formal confines of Orion and back into far eastern Taurus, where it belongs! The ringed planet is now about two degrees almost exactly east of Zeta Tauri, the star that makes the southern horn of the celestial Bull. The northern Zodiac is now coming into fuller evening view. Around 8 PM find Pisces to the south spanning the equator below the Great Square of Pegasus. Climbing higher to the east is the flat triangle that makes Aries (the Ram), whose figure lies well north of the ecliptic. To the east of Aries is Taurus and more to the east (to the northeast of Great Orion) is the most northerly of this ancient set of figures, Gemini (the Twins). In between Aries and the curve of stars that makes Andromeda, find a better triangle that makes Triangulum. Deep in southern skies, visible only from south of 20 degrees north latitude, is another, Triangulum Australe, the Southern Triangle.